Several times a year, when we feel like it, the Golden Journal brings Gold Club members a set of extras for their Avalanche Press games. Our new-model Golden Journal features a “real” booklet, just like a small magazine, and a small set of die-cut, silky-smooth playing pieces. 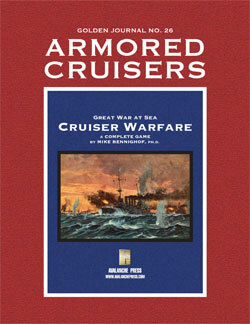 Our 26th issue, the second in this new format, has Cruiser Warfare as its game feature and the featured variant centered on armored cruisers. We have the armored cruiser Blücher as re-designed with 11-inch (280mm) guns in place of her actual outfit of 8.2-inch (210mm) pieces. And additional armored cruisers that never existed, for use in Cruiser Warfare, replacement pieces for armored cruisers that had their armament adjusted in the Final Edition of Cruiser Warfare, and finally Canadian Prime Minister Wilfrid Laurier’s 1910 plan for a squadron of one battle cruiser and four light cruisers. You get 20 pieces altogether. Plus scenarios/variants so you can play with the new toys and background articles telling about them. How do you get it? Only by joining the Gold Club. There's a shipping charge for it, but it’s so lightweight that it usually adds nothing to the shipping total when you order it with something else. Limit one free copy per membership.